FLORENCE — With restoration crews on site and a master plan in the works, Florence’s historic Rialto Theater is still a work in progress. 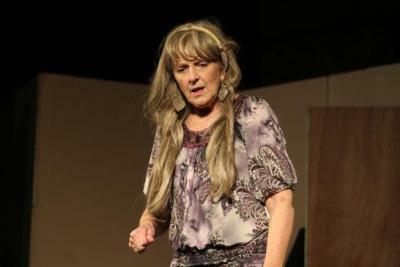 But as actors from the Fremont Civic Theatre rehearsed for an upcoming play there Tuesday, a major milestone became closer — starting next week, actors will grace the Rialto’s stage for the first time in 20 years. 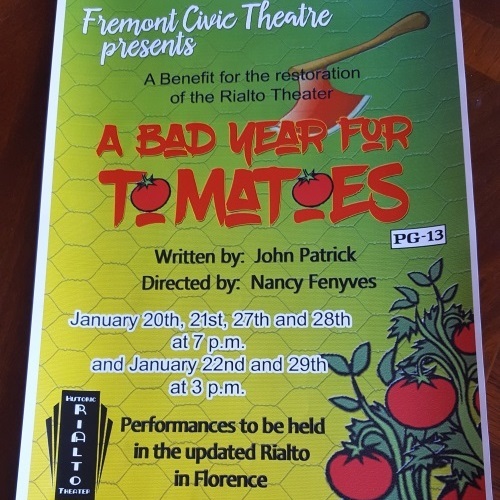 With a production of the play “A Bad Year for Tomatoes” set for the last two weekends of January, the Fremont Civic Theatre plans to raise funds to help complete the theater’s restoration. For Nancy Fenyves, the director of the play and a Rialto Theater board member, the upcoming play is particularly special. The theater, which first opened in 1923 at 209 Main St., was a center of culture in Florence for several years before it began to deteriorate in the 1990s. Since then, it has periodically undergone restoration efforts. But in 2016, when fundraising began picking up more steam, the Rialto board finally was able to begin major work to bring the theater back to life. Todd Williams, the board’s vice president, said the Rialto raised $100,000 in 2016. Much of that, he said, was a result of theater project manager Larry Baker, and his wife, Beryl, who offered to match any amount of money the theater could raise. By the play’s opening night, the theater will be ready for guests, even though it has a way to go before completion, Williams said. To accommodate the Rialto’s current condition, Fenyves said she chose “A Bad Year for Tomatoes,” a comedy that doesn’t require a set change. But that’s not the only reason she chose the play. 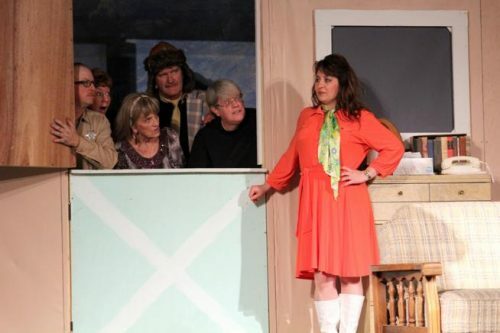 The play, which is set in a small New England town, follows Myra Marlow, a famous actress who wants to escape Hollywood to write her memoir in a quiet setting. But, Fenyves said, that’s not what happens. “Well, the townspeople don’t recognize her, but that doesn’t mean they’re not going to leave her alone,” she said, adding that small-town characters create chaos for Marlow. Heather Strickler, who plays Marlow, said getting to know her character has taken some work. After some preparation, though, she said she’ll be ready. The Rialto will be ready, too, Williams said. “We’re excited. It won’t be finished, but she’s coming,” he said. 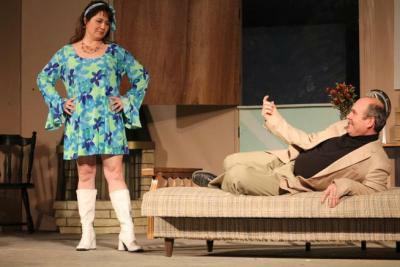 For families, the Fremont Civic Theatre rates the show as PG-13. 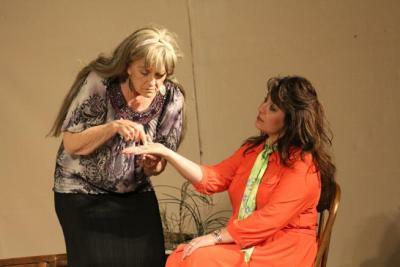 The play’s opening night, which will feature a special gala, is set for 7 p.m. Jan. 20. That showing, which is priced at $35, will feature drinks and hor d’oeuvres and is limited to 100 tickets. The Fremont Civic Theatre is only selling those tickets via their phone number, (719) 275-8989. Tickets for other showings, which fall on weekends in the rest of January, will cost $7 for seniors and students and $10 for adults. For preferred seating, in the first four rows, the tickets are an additional $3. Those showings are set for 7 p.m. Jan. 21 and Jan. 27-28 at 7 p.m. and 3 p.m. Jan. 22 and Jan. 29. Tickets can be purchased in Cañon City at City Market and Absolute Accounting, and in Florence at the Fox Den and Heartland Antiques.